Michelle Nebel: Words to Spare • Page 2 of 59 • Out of the overflow of the heart, the mouth speaks. 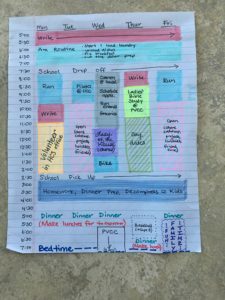 I wanted to share one of my favorite tools for organizing life as a mom: time-blocking. 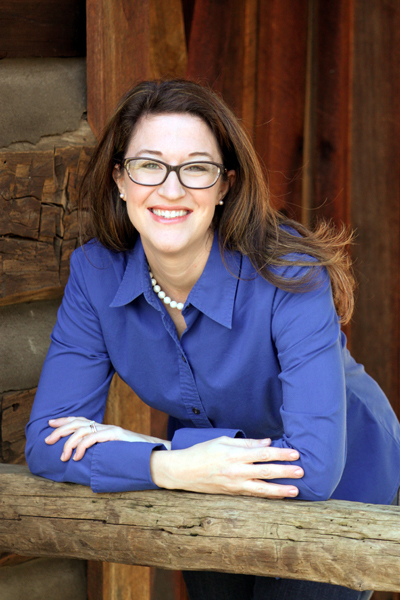 This approach has worked for me in so many stages of life – when I was a new stay-at-home with little kids, when I was homeschooling, and now as a stay-at-home mom with school-aged kids who are away from the house for a few hours each day. The first thing I write in is school drop off and pick up. These are the rails on the road of my kid-free time, so I need to respect the time they take. Next, I put in two hard and fast time commitments: my volunteer afternoon at my kids’ school, and the Ladies’ Bible study I joined in the fall. Then I considered time for fitness. I have been attending a group fitness class, so it went on the weekly grid, and then I added two days to run and one day to bike. On Wednesday, I typically try to schedule errands and appointments in the morning while our housecleaners are here working their deep-scrubbing magic. I like seeing them and chatting each week, but then I try to get out of their hair because they work as a great team and I don’t want to disrupt their flow. When I get home, the lovely clean house makes me want to tackle my chores – I stumbled across an Instagram friend who calls the day she manages all the home stuff that tends to pile up her “lady of the house” day. It cracked me up and I borrowed it! That left me with Tuesday, Thursday, and Friday afternoons wide open. Thursday is Chris’ day off, and we don’t get hang out and go on dates every week – but I like reminding myself of the opportunity. So it’s penciled in for day dates! Then I have blocks on Tuesdays & Fridays I labeled for chore catchup (’cause let’s be honest, there’s always a few more chores to tackle! ), hobbies, projects, and friends. Y’all. That has been the very best investment I’ve made in my mental health this school year. I’ve been more conscious to schedule time with friends – a few coffee dates, breakfast dates, lunches, walks, and just hanging out with people – every week. The reality is that I can’t spend three hours, two days a week, just chilling with my homies. I do have some adulting to do. BUT having that reminder in my time block reminds me to try to get together with someone each week. It’s also reminded me that the projects and hobbies I love don’t just happen – I have to carve out time to do them. The after-school/evening section undergoes the most shifting. When I created this page, my youngest was playing baseball. That season has ended, but in a few weeks she is heading back on the ice for skating lessons one night a week and her big sister is starting art lessons one evening a week. This tool has been so wonderful for me. I love the flexibility — if a certain doctor can’t see me on my preferred Wednesday, then I try to shift all my errands to whatever day the appointment needs to be, so that I can still focus on utilizing one day to be out of the house a bunch and another day to stay home and do my projects or chore catchup. Over the next few weeks, I’m going to share more of the ways I stay personally organized and keep my family organized! Check back soon. When I was a girl, I adored Anne Shirley. I hadn’t her tragic background nor her dramatic flair, but I loved the exuberant way she expressed herself. Those monologues, when an enraptured Anne would go on and on about something she loved, charmed my socks off. That was how I talked, too — inside my head. I wish I could remember having a moment of epiphany, but instead my late teens and early twenties simply gave me a gradual slide to a state of comfort with the way my mind worked. I stopped fretting about a clinical diagnosis (and I learned not to throw around the word ‘crazy,’ even in my own mind about my own self) and accepted the fact that I have an active imagination. I eventually realized that the way I’m wired keeps my sense of wonder and laughter close to the surface – which is definitely part of what makes me a great teacher of young kids. I realized that my imagination sometimes works against me, when it manifests as generalized anxiety, and that I can control that part with medication, therapy, and mindful practices. (So: interestingly enough, I do have a mental health diagnosis, just not the one I feared when I was a kid.) I realized that my imagination is like a puppy with a lot of energy, and if I set it to the task of writing –dreaming up an entire novel-sized world of people and places and situations– it’s a lot less likely to bother me by misdirecting that energy*. So. Like the effusive Anne Shirley, I’m glad to live in a world where we get to enjoy Octobers. This time of year is beautiful here in western Kentucky, and autumn always seems to renew my energies. I’m thankful for what I’ve learned about imagination, because embracing mine opened up the path for me to explore writing. Even if my novels never hit bookshelves, the act of writing them has been wonderful in and of itself. *for more on that notion, I highly recommend Big Magic by Elizabeth Gilbert. Her analogy about creativity as an overactive dog sparked an instant sense of “hey me too!” in my heart and you might enjoy it, also. It’s nearly that time again, y’all. It’s about to be November, and that means NaNoWriMo is upon us! National Novel Writing Month is a really fun, inspiring initiative where folks sign up to attempt to write a 50,000 word novel in the 30 days of November. It’s frantic. It’s beastly. It’s exhilarating. It’s insane! I’m doing it again. I ‘won’ Nanowrimo in 2015 (anyone who completes 50,000 words by November 30th is declared a winner) and took that manuscript through another 40,000 words, beta readers, critique partners, edits and rewrites, queries and submissions and revise-and-resubmits to literary agents… and now it’s literally shelved in my office. Maybe someday I’ll pull it out and polish it up and send it back into the query trenches. Maybe it was never meant for the world’s eyes. I’m not sure, but it was a wonderful experience and I finally feel ready to try again. I’m not quite playing by the official rules, however. Nano encourages writers to start fresh with a blank page and a brand-new idea on November 1st. They tell people to do some research, character sketches, outlining and such – but no writing until the month begins. A few months ago — after lots of non-writing around these parts– I was laying in bed, about to drift off to sleep, when a Perfectly Formed First Line came into my head. I sat straight up and said it out loud, then tapped it into my notes app on my phone. Eventually, I daydreamed up the person behind that first line, and I got a tiny sliver of a notion of who she was and what she wants out of life. I sat down and started writing. At the end of September, I had about 15,000 words. Enough to know that I really love this character and this setting. I’m a pantser (as opposed to a plotter, one who plots and outlines each scene before writing; I fly by the seat of my pants) so I had very little idea what the story was about in a big sense. I had no elevator pitch, no back-cover copy. But I loved this girl, as broken as she is, and I was watching her fight for redemption, and I loved it. I set a goal to double my word count by the end of October. If I added 500 words per day, I could hit 30,000; then if I play along with Nanowrimo and add another 50,000 words, I would have a complete (or very nearly so) first draft by November 30th. Today is October 24, and I have 28,625 words in this manuscript. (I know, if you’re a nonwriter that is total gobbledygook! I apologize. It’s about ten chapters, or not-quite-100-pages in an average sized novel. Anyone else trying Nano? Let me know if you need a Writing Buddy! Last time I blogged, I wrote: I’m praying for full healing of Susannah’s kidney cyst, or that if it’s still present when we get to nephrology that they’ll decide it’s a simple cyst which needs no intervention. I’m praying for the results of her echocardiogram, that it would show her little heart beating in perfect rhythm. I believe God is able to give us both those good gifts. And in the past 21 days, God has answered both of these prayers. On June 28, Susannah had her echocardiogram, and the results were completely normal. No arrhythmias or anatomical problems. Her heart is perfectly healthy. Praise the Lord! On July 19, we met with the nephrologist about her kidney cyst. It is small (6mm x 7mm) and appears to be simple. (This terminology is in contrast to a complex cyst, which is more likely to be precancerous than a simple cyst.) At this time, the cyst does not require intervention or treatment. Praise the Lord! –follow-up visit in 6 months to include repeating labs & ultrasound. If her labwork now is normal, we maintain the care plan until her 6 month follow-up. At the 6-month visit, if the labwork is still normal and the cyst is unchanged, then she will need only yearly or biennial monitoring. So, how can you pray for us? Please pray: that Susannah’s bloodwork would show healthy renal function; that her ultrasound would confirm that the cyst is simple in structure and size; that her blood pressure would remain normal; and that the cyst will not grow or duplicate.